Unwrap the cream cheese from the package and place in a large mixing bowl. Set the bowl aside for several hours, or until the cream cheese has reached room temperature. Preheat the oven to 350 degrees Fahrenheit. If you preheat the oven just before you begin preparing the cheesecake, it will be all set to bake by the time you’re finished assembling the cheesecake. Add granulated sugar and vanilla extract to the bowl with the cream cheese. Beat on medium speed with an electric mixer until completely smooth. Add eggs one at a time beating on medium speed until well combined. If you can’t find crushed candy canes, you’ll need to do it yourself. The easiest way to crush them is by placing them in a durable plastic bag and pounding them with a meat tenderizer. Note that if you don’t have candy canes, you can use starlight mints, instead. Using a wooden spoon, stir in ½ cup of the crushed candy canes and mix until it’s well combined. Pour the cheesecake batter into the pre-made crust and sprinkle with ¼ additional cup of crushed peppermint candies. Bake this cheesecake until it appears to have set, which should take about 40 minutes. At this point, the center will be almost completely set but will jiggle a little bit. Let the cheesecake cool on the countertop for about an hour and then transfer it to the refrigerator for another two hours to let it set. Remove the cheesecake from the refrigerator. 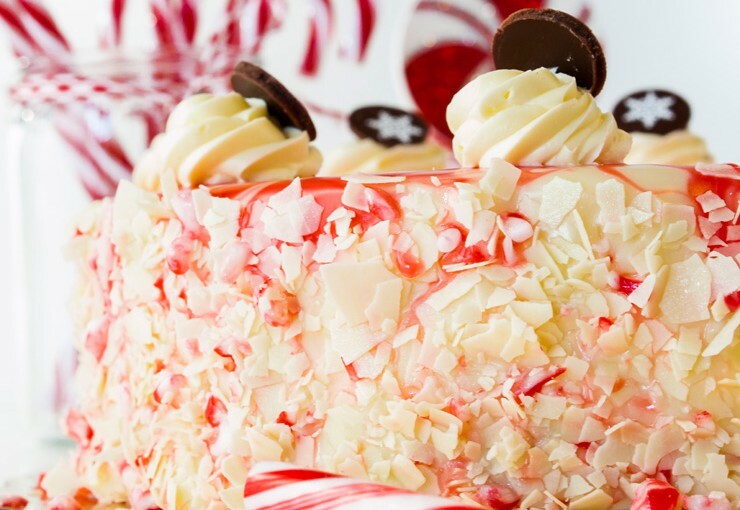 Top with the whipped topping and sprinkle with more crushed candy canes. Chocolate Peppermint Cheesecake. Melt 6 ounces of semi-sweet chocolate chips in the microwave or over a double boiler. Beat into the cheesecake mixture after adding the vanilla extract and granulated sugar. Follow the rest of the recipe as usual. Chocolate Chip and Peppermint Cheesecake. Follow the recipe as directed above. Add ½ cup mini semi-sweet chocolate chips when you add the crushed candy canes. Sprinkle ¼ cup mini chocolate chips over the whipped topping when you sprinkle the remainder of the crushed candy canes.